Ich spiele Warhammer 40K im Schwarzwald! 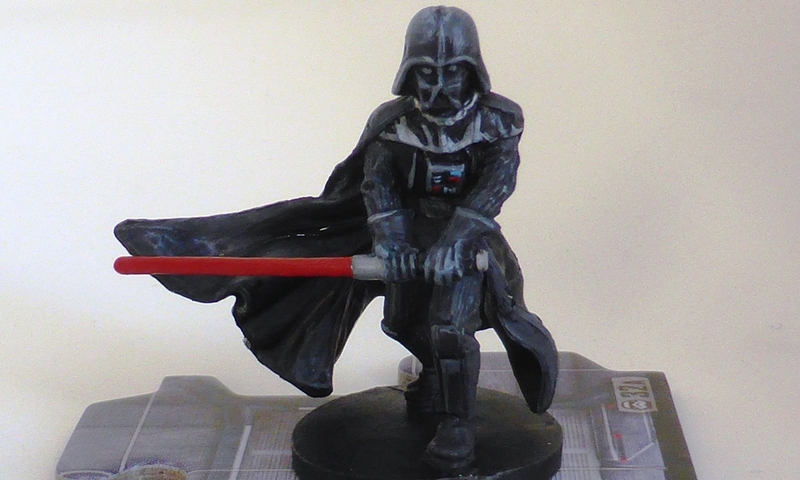 Final steps on my Darth Vader miniature included a coat of Citadel Purity Seal, followed by re-application of glossy ‚Ard Coat, notably on the light saber. 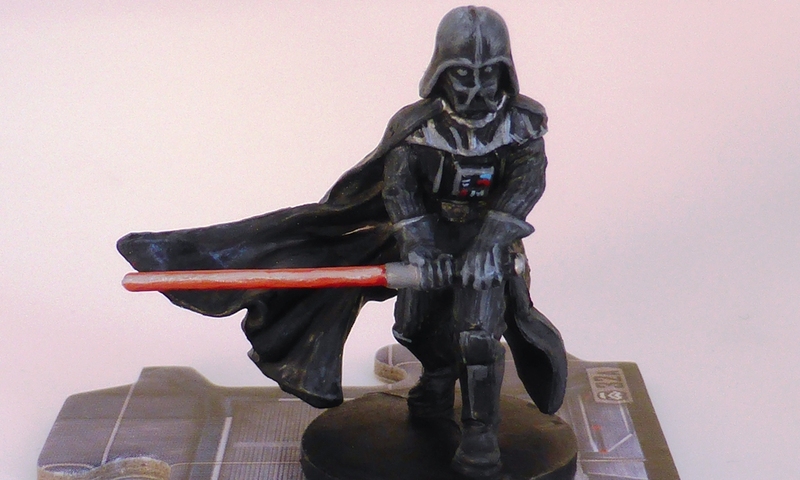 I also rebased Darth Vader, adding a little grimdark skull to go with it (if anyone deserves a skull to his feet, it is Darth Vader). 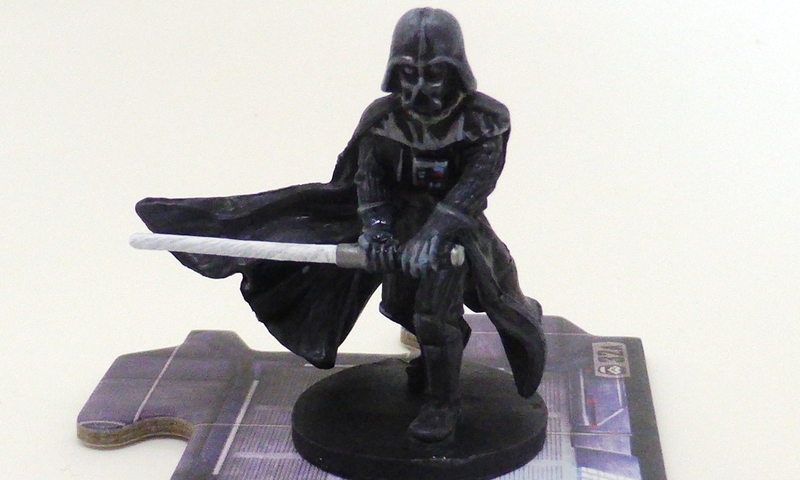 The next step in painting my Imperial Assault Darth Vader was the light saber. I started with two layers of red over the white base coat of the light saber blade. The first layer in Mephiston Red, the second layer in Evil Sunz Scarlet. Once I had a nice red, I started adding a lighter highlight to the upper and front part of the blade with Wild Rider Red. Another suggestion, which I picked up from YouTube, was to attempt the light saber’s glow effect of the light saber with a line of Rune Fang Steel, a very bright silver, and not a bright red or white. I went back and forth on this, trying to get it right. I am not 100% happy with it. 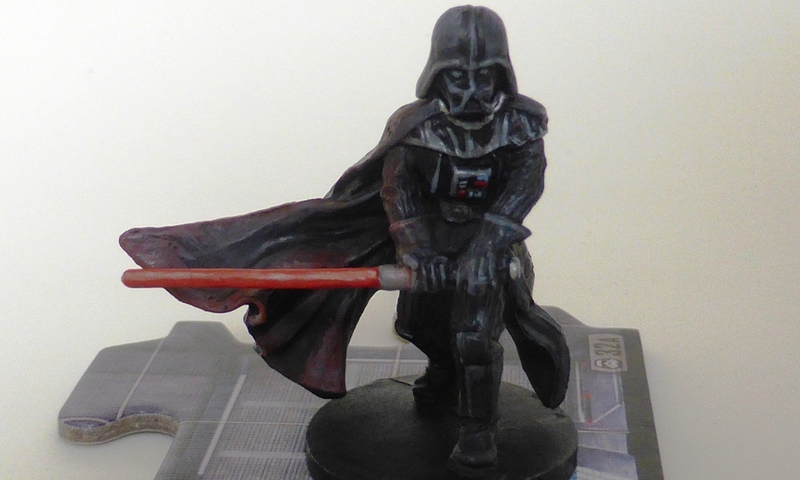 I also started adding a red glaze – Citadel’s Bloodletter – to the areas surrounding the light saber, to simulate the glow effect. 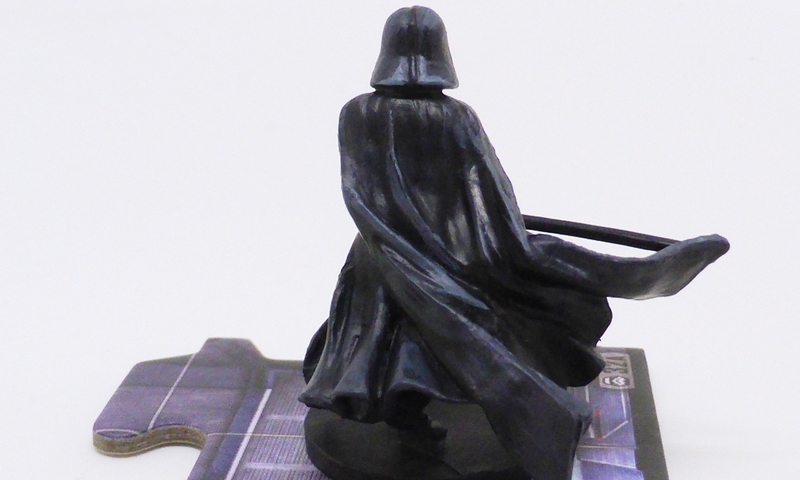 The red glazed did show on some areas, notably the glove and arm, but wouldn’t take to the cloak right next to the light saber, which was still to dark. To help with this, I went back and added more highlights with a mix of black and Fenrisian Grey to the cloak around the light saber to create a basis for the glaze. After applying the new highlight to the cloak, I went back and applied several layers of Bloodletter for a red effect on the right side of the miniature. I also toned down the silver line on the light saber itself. 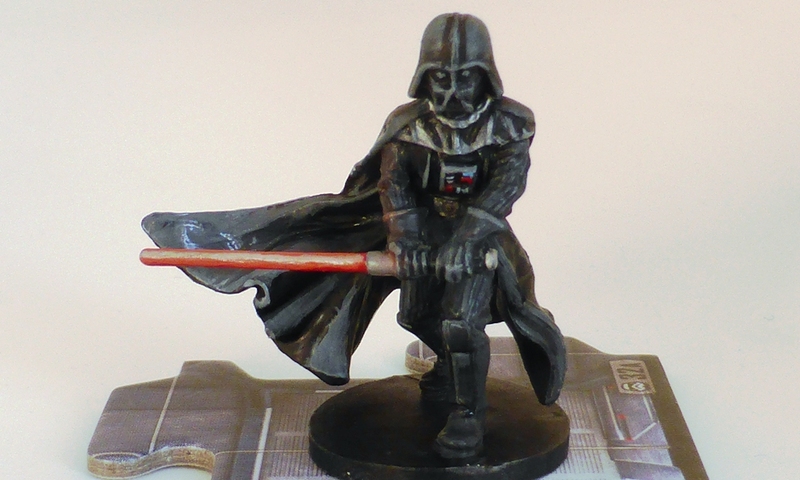 Next step: rebasing Darth Vader. 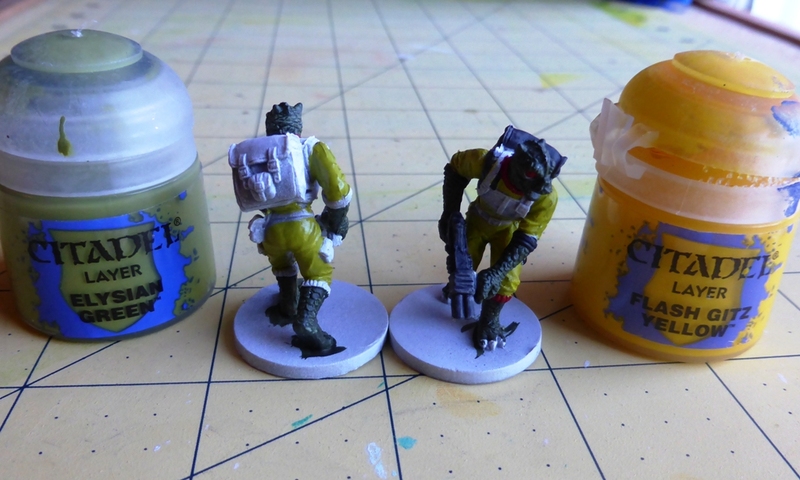 Onwards with painting my box of Fantasy Flight Games‘ Imperial Assault. 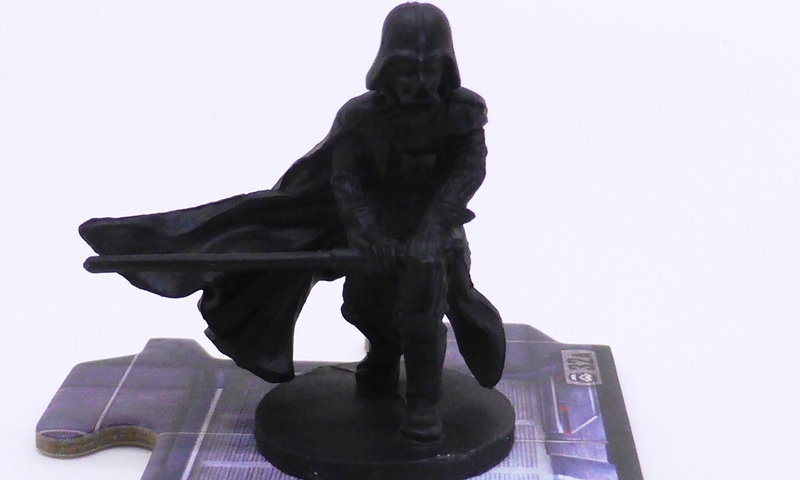 I chose Darth Vader as my next project. As I have basically no experience painting black details, I once more turned to Sorastro’s Painting Tutorials for inspiration. No more than giving the miniature a good coat with Citadel’s black primer. Highlighting Darth Vader is where the fun starts. I used a mix of Army Painter Matt Black and Citadel Fenrisian Grey, adding more and more Fenrisian Grey as I went to brighten the highlights (or some more black, when I found the contrast too stark). Once I was happy with the highlights, I let the miniature dry, before giving it a wash with Citadel Nuln Oil. Finally, once the wash had dried, I went back to some of the highlights, this time adding a bit of silver metallic paint into the aforementioned mix. 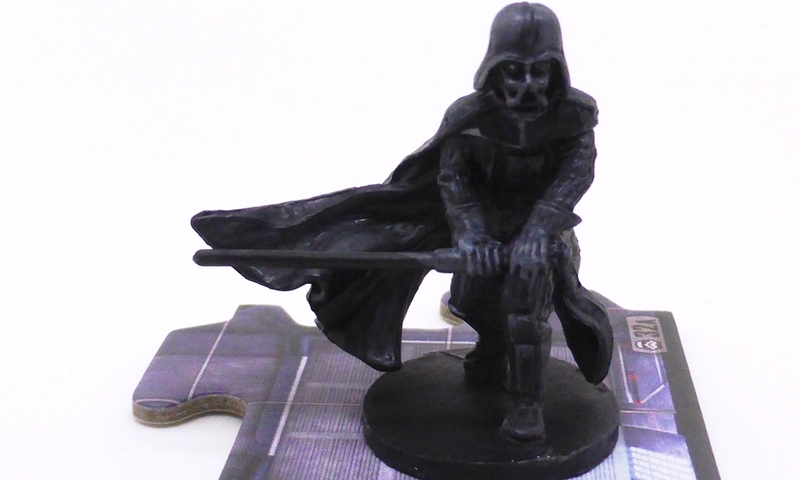 I also used the metallic paint for the belt, the light-saber handle and the chain holding the cloak. I painted the red (Mephiston Red) and blue (Lotheran Blue) buttons on the chest panel. Last but not least, I gave the blade of the light saber a coat of Ceramite White in preparation of painting it in a vibrant red. 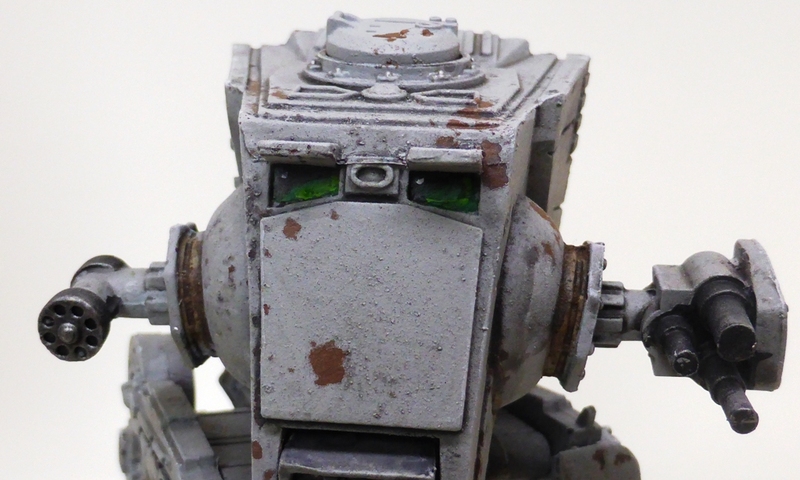 After the initial salt weathering on the AT-ST, I went to work on the details. The weapons were painted with Army Painter black, followed by a think „wet-brush“ of chain mail metal and, after drying, a wash of Nuln Oil. The entire miniature got a good wash of Nuln Oil. After the wash had dried, I added a few lines and highlights with GW’s Administratum Grey. I also painted the cockpit windows with layers of Warpstone Glow, Moot Green and Gauss Blaster Green, along with a little bit of black and a white highlight dot. 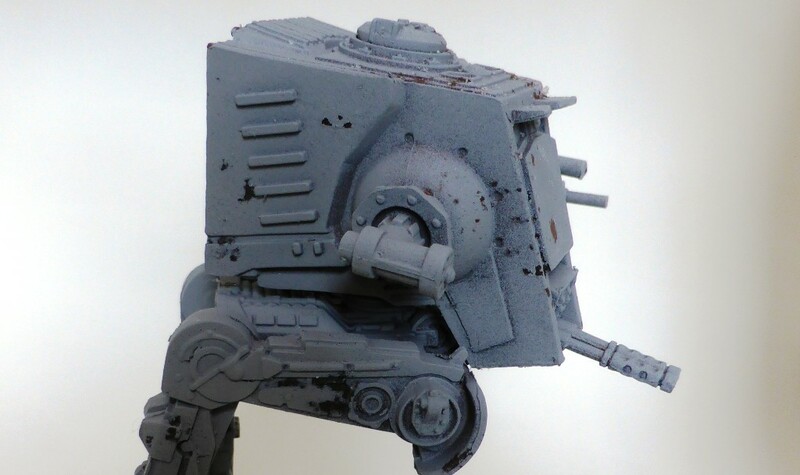 Another thing I wanted to add to the AT-ST was a magnet to the hatch, so I could swap it out for an old Games Workshop Tank Commander, who would serve as arch-villain General Weiss in my Imperial Assault campaign. For this, I simply filed down the peg of the hatch-bit, so I could use a 2mm magnet and still have the hatch close. I added a similar magnet to a Tank Commander and glued a counter-part magnet into the hole on top of the AT-ST, normally used to plug in the hatch. 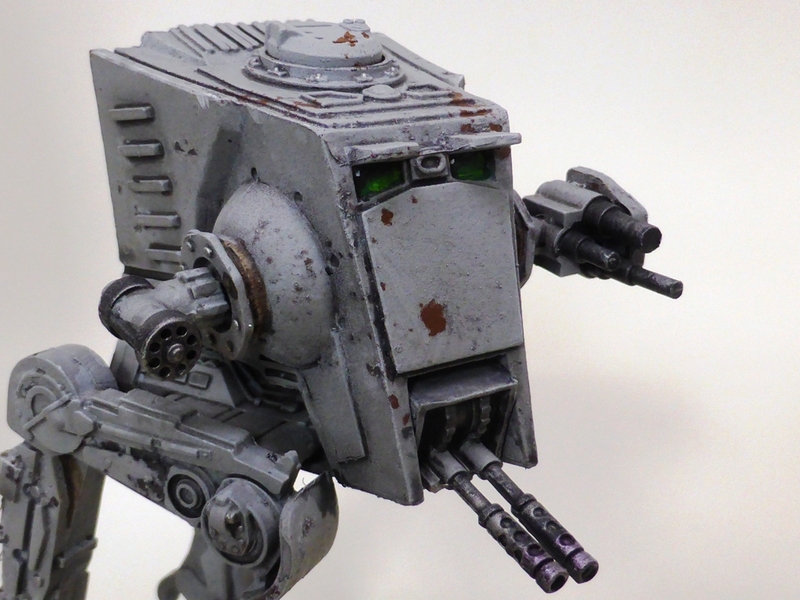 After finishing the Trandoshan Hunters, I wanted to get started on the AT-ST from the Imperial Assault Game. 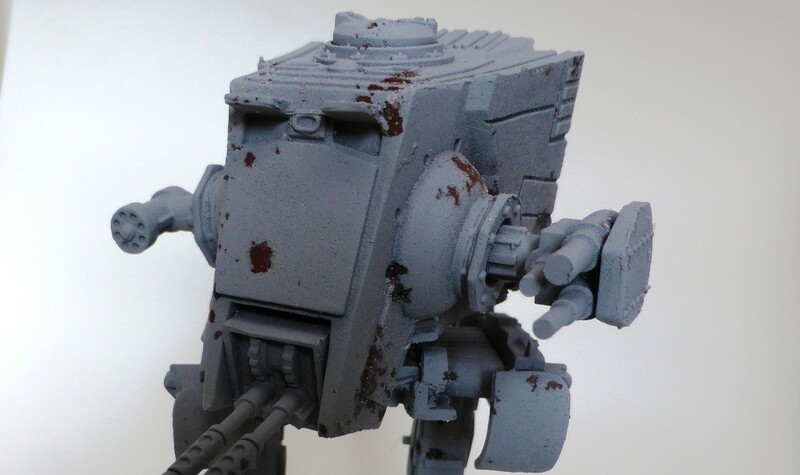 While I aim for a traditional grey look for the Imperial walker, I decided to try out a weathering technique I have never tried before: Salt Weathering. 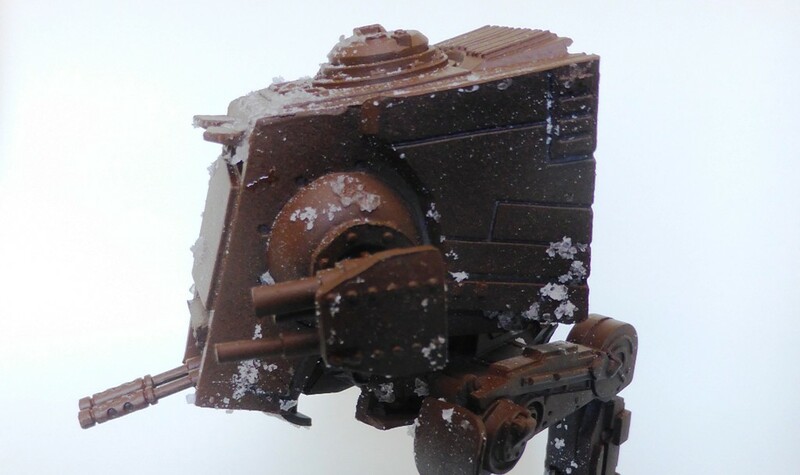 The idea is the use salt (of the more coarse kind) as a random masking-material to create a weathering effect. I hope to achieve a rusted, worn-down look. I started by spraying the miniature with a coat of Citadel Mournfang Brown. 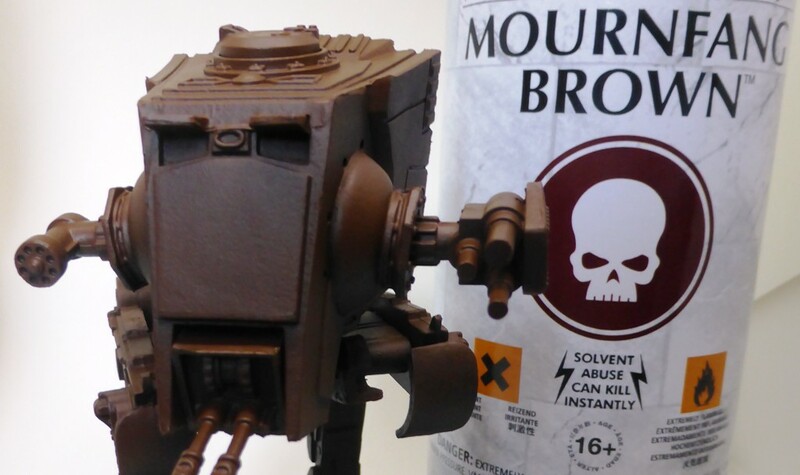 This should provide a brown, „rust-like“ colour to shine through the grey painting of the AT-ST thanks to the salt weathering. Once the miniature was dry, I applied water to areas I wanted to weather. Afterwards, I sprinkled the wet parts with salt, which sticks to the moist areas. I thought I was quite liberal in the application of salt, possibly overdoing it. It certainly felt like a lot of salt at this stage. In retrospect, I probably could have added a bit more. 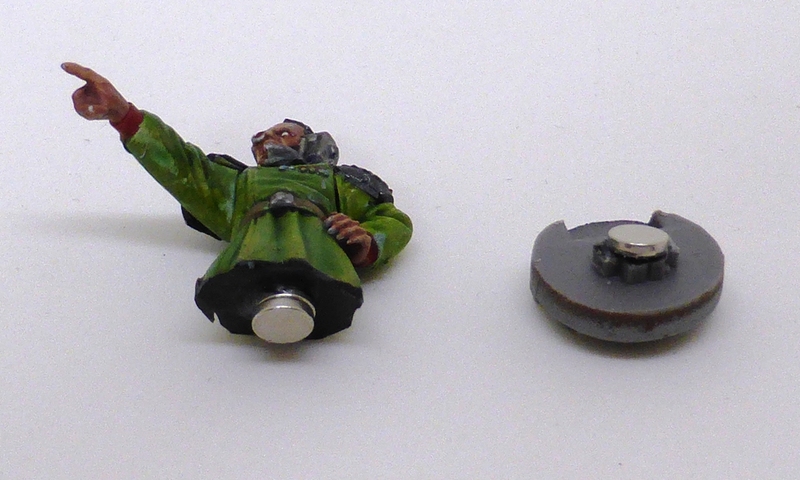 After everything was dry, I sprayed the miniature with the actual basecoat I wanted to have for the final paint job. 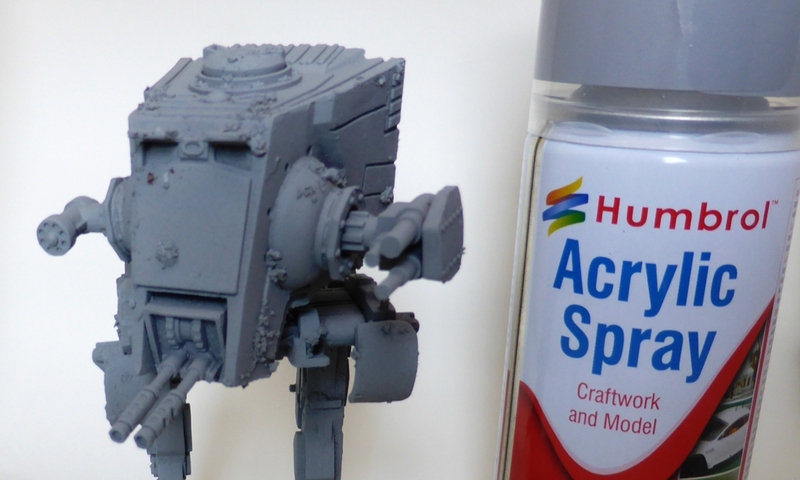 In this case, I used the basic matt grey from Humbrol, which seems like a good shade for Imperial vehicles. Finally, the magic trick. 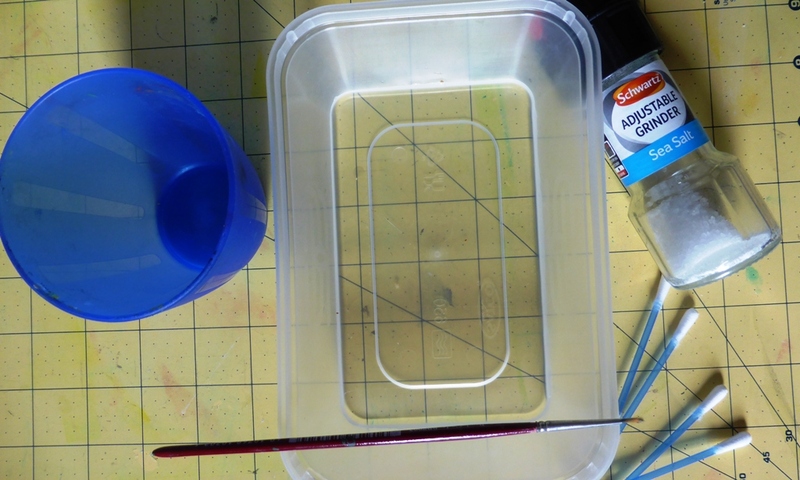 Removing the salt with a soft brush to reveal parts of the brown under the grey basecoat. Having never done this before, I was excited to see how this would turn out and was very pleased with the result. I expected to do worse on my first try. 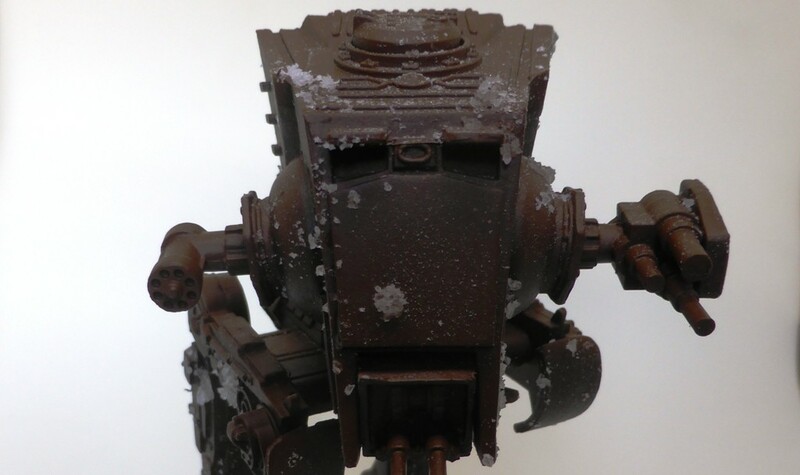 That said, the weathering effect wasn’t nearly as excessive as I feared. 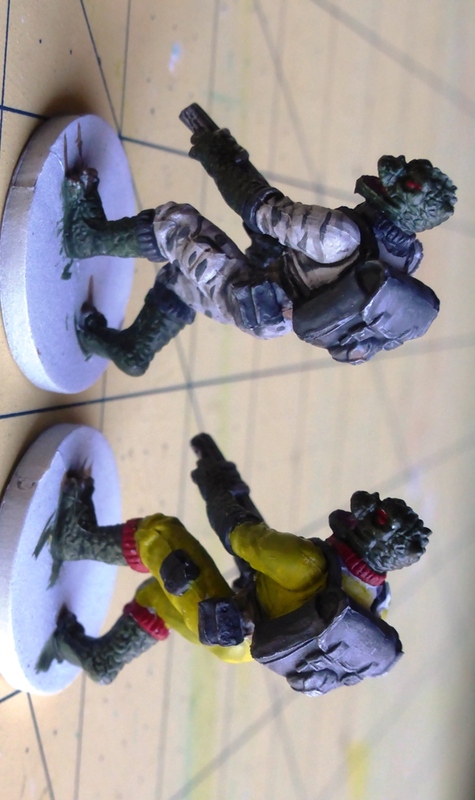 I have been busy finishing my Trandoshan Hunters for FFG’s Imperial Assault. The main steps were all laid out in my first article. What was left to do where some small highlights, for example in the eyes, a bit of cleaning up and re-basing the miniatures on Citadel 25mm bases with a bit of scenery. Voila! 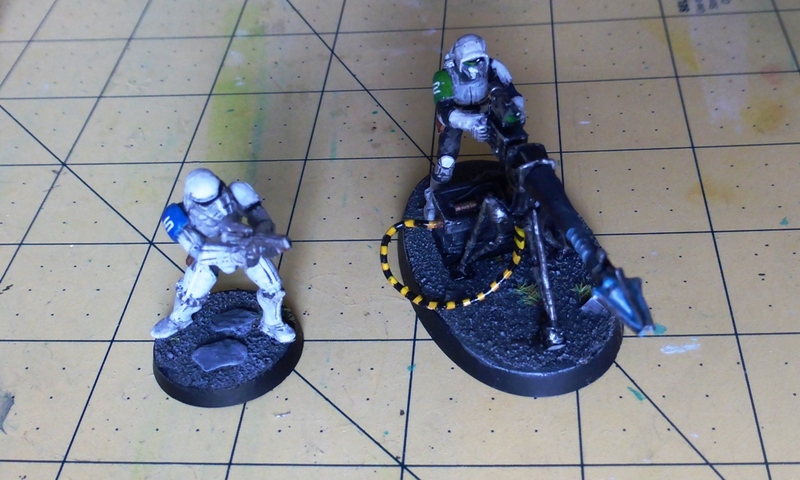 My Trandoshan Hunters ready to hunt down some Rebels. Those are definitely a lot of fun to paint. I cannot recommend them enough! 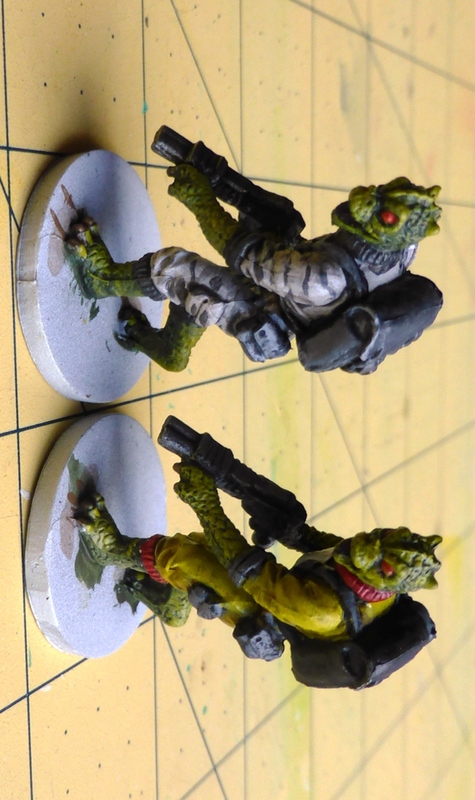 Continuing with my project of painting up Fantasy Flight Games‘ Imperial Assault, I started working on the Trandoshan Hunters, whose most notorious representative is the Bounty Hunter Bossk from The Empire Strikes Back. Once again, most of my inspiration came from the fantastic YouTube guide by Sorastro’s Painting. 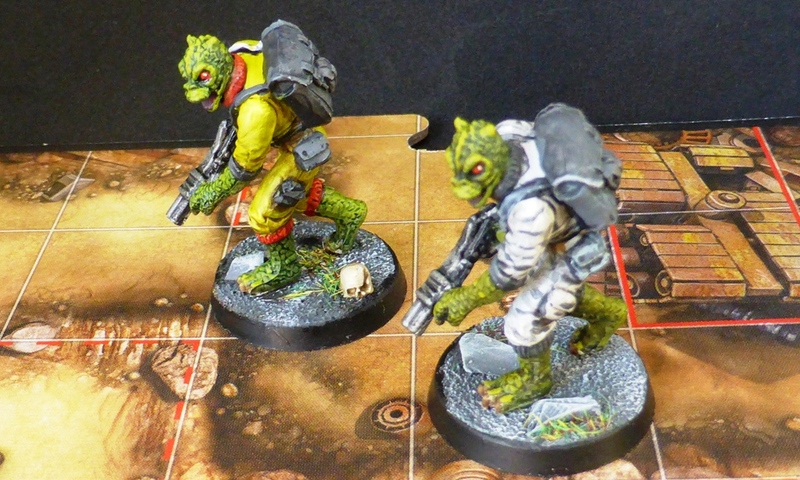 Once again sticking closely to Sorastro’s Painting tutorials, I painted two variants of Trandoshan Hunters. 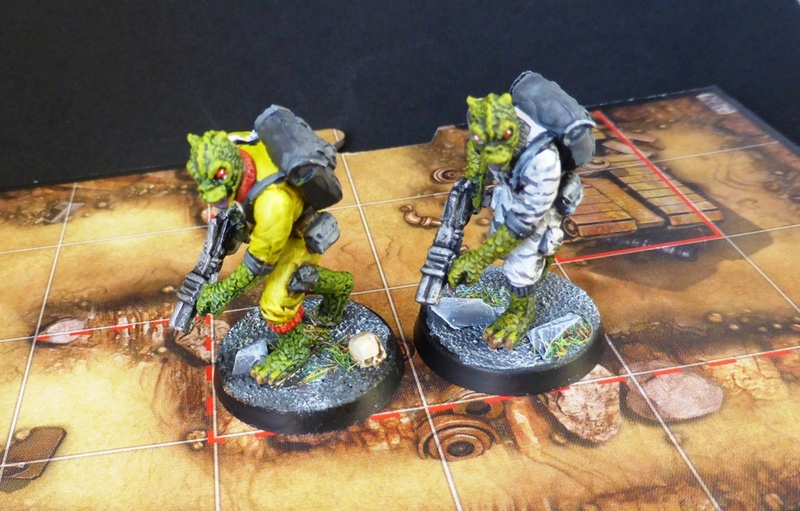 Two Trandoshan Hunters in a snow/urban camouflage and two in a yellow-green jumpsuit similar to Bossk from The Empire Strikes Back. 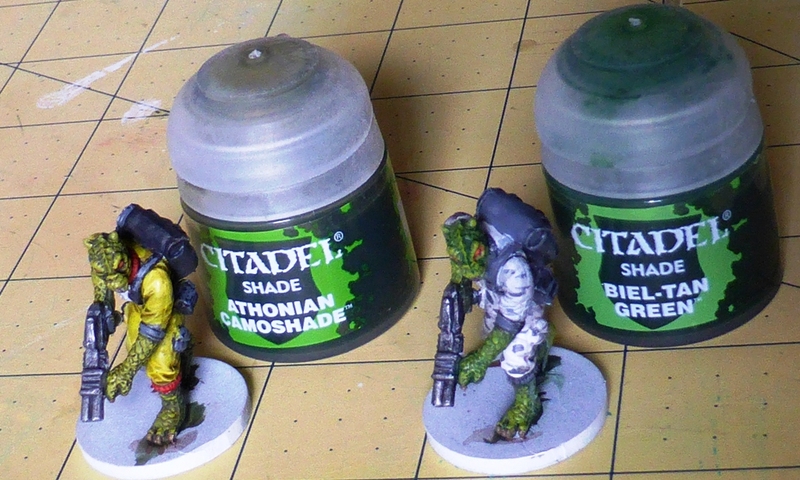 For the yellow-green I used a roughly equal mix of Flash Gitz Yellow and Elysian Green. It’s a wonderfully „ugly“ colour in the best Star Wars tradition, and one I certainly would not have come up with on my own. After the base colours, I shaded the yellow-green jumpsuit, the mouth and the red parts with Agrax Earthshade and the white jumpsuit, the backpacks, weapons and grey trims with Nuln Oil. I did not yet shade the skin, which was highlighted first with Elysian Green and second with a 50/50 mix of Elysian Green and Flash Gitz Yellow. The yellow-green jumpsuit was highlighted with the abovementioned 50/50 mix, adding more yellow with each step. I also gave it a glaze of Lamenters Yellow. And I keep finding mould-lines. Note to self: Clean the miniatures properly! For the skin itself (or scales), I took another advice from the fantastic tutorials by Sorastro’s painting, shading different Trandoshan Hunters with different green shades from Games Workshop to achieve a variety of skin tones. I am making some progress with painting up my box of Imperial Assault. While some of the miniatures, like the Nexu, are wonderful, others are less thrilling. One miniature I found a bit disappointing was the Stormtrooper E-Web Engineer. 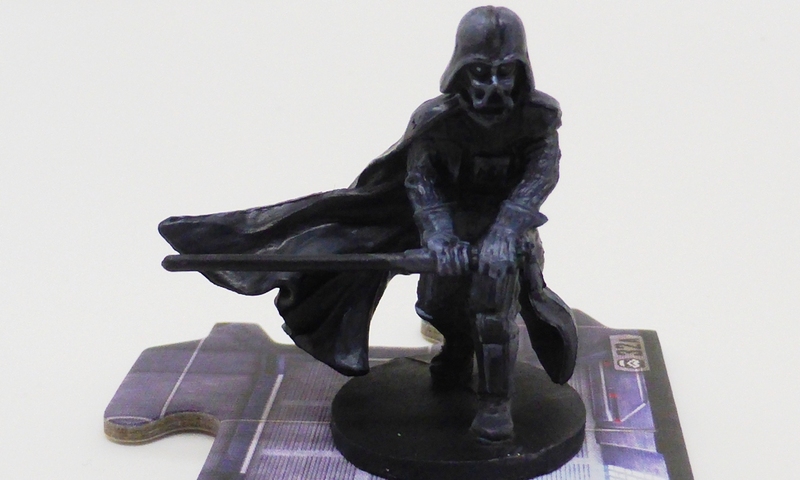 The soft plastic used by Fantasy Flight Games seems less suitable to long, sharp forms such as weapon barrels as it is for organic forms like the Nexu. The E-Web Engineer’s barrel was particularly wobbly and not at all intimidating. 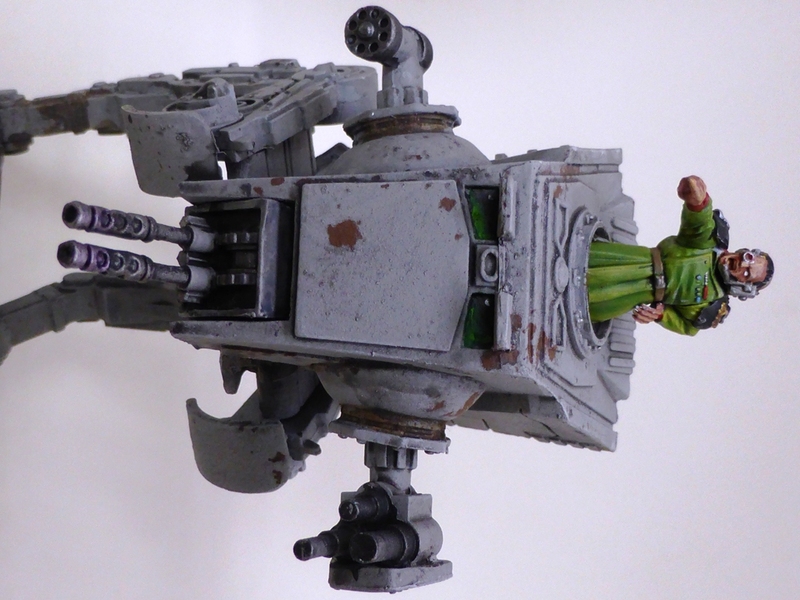 To get arround this, I dug into my Games Workshop bits-box and retrieved some Eldar guns. 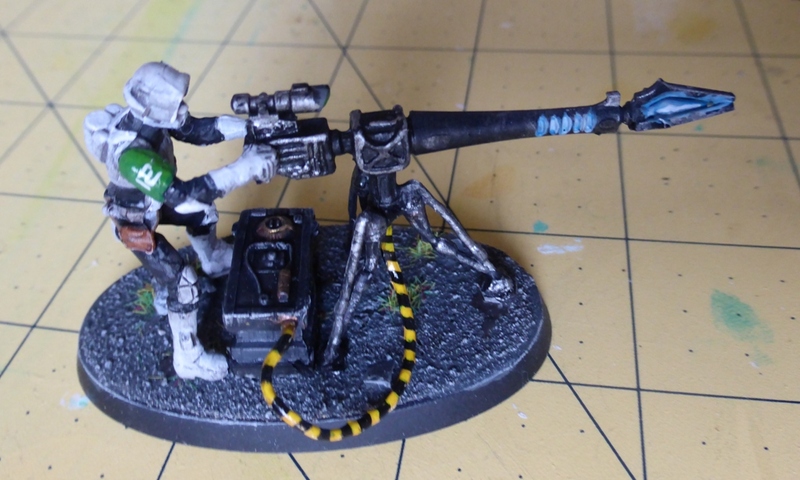 Though 40K weapons are mostly too large for Imperial Assault conversions, the slender Eldar-stuff just about works. 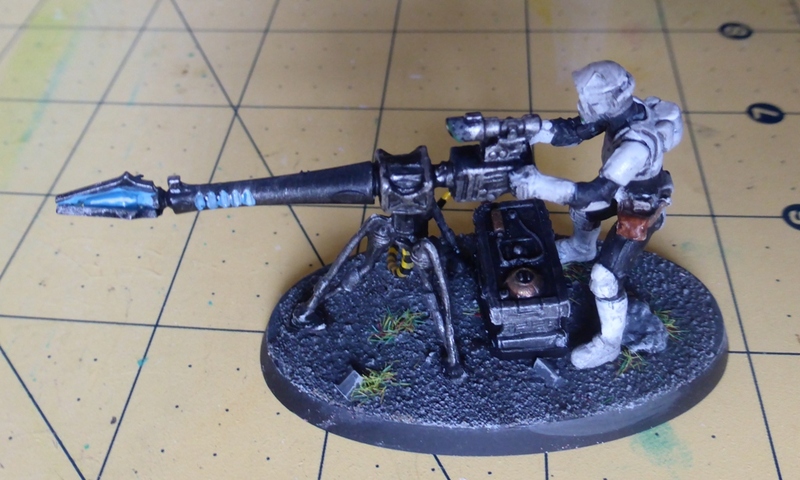 So I swapped the barrels of the Engineer with some Eldar-guns. The result: A beefier, much more intimidating gun. Fire at will!